I love Douglas Coupland. I think his books are amazing and they have yet to disappoint. 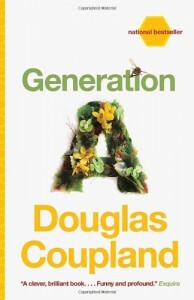 [b:Generation A|6093864|Generation A|Douglas Coupland|http://d.gr-assets.com/books/1320492748s/6093864.jpg|6270883] is about a dwindling population. It follows the lives of five young adults who were all stung by bee's in a world where bee's were thought to be extinct.